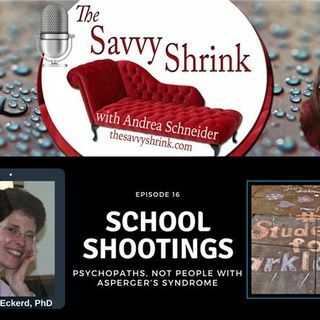 Andrea Schneider, MSW and host of The Savvy Shrink discusses school shootings and why it is vitally important to recognize a correct diagnostic profile. Her guest is Dr. Marcia Eckerd who has been in practice as a licensed psychologist since 1985. She was appointed by the State Legislature of CT to serve on the Autism Spectrum Disorder Advisory Council, and on the Clinical Advisory Committee of the Aspergers and Autism Association of New England. She helped establish the Yale-Norwalk Hospital ... See More collaboration Pediatric Development and Therapy Center. She trained extensively in psychotherapy, cognitive-behavioral therapy (CBT), mind-body medicine, neuropsychological testing and EMDR both for children and adults. As Director of Clinical Programs of the New Learning Therapy Center, she created a social skills program as well as continuing education program for professionals. She has written several articles which are featured on PsychCentral. More on her bio can be found here. Visit her on LinkedIn and Twitter.